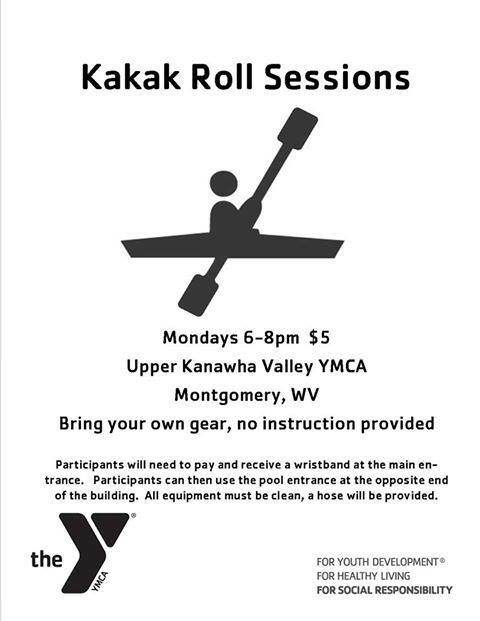 Kayak Roll sessions are scheduled to start Monday November 5th. from 6pm to 8pm. Not sure how long into the winter they will run. 5 dollars for the general public, free for YMCA members. I added this to the calendar on the WVWA website. Will these sessions continue after the New Year? I just found the posting and would like to learn to roll before the new season starts. Have there been many people participating? I read that there is no instruction, have there been club members there who can offer tips? Karen—no roll session this Monday 12/31. They will start back up on Wednesday January 2nd. Attendance has been mixed with some sessions being 20+ people and otherr sessions having just a few boaters. Most of us are local Fayette County boaters (we have one gentleman that comes all the way from Parkersburg), it is bring your own gear and there is no formal instruction. With that being said though there are more than enough of us to help new folks. Great! Thanks for the info. I try to go to spin classes on Mon & Wed but will try to make it up on a Monday as time permits. Are these sessions still happening? Are the pool sessions still going on ? pool sessions in montgomery still going on, good turn out last night, They'll keep going as long as bodies keep showing up! Team River Runner Pool Sessions ended in Beckley.